Prophesying house prices and rental rates with any degree of accuracy is extremely difficult in even normal market conditions. We don’t know the implications of a Yes vote for tax, currency, borrowing and so on, so trying to assess the effect on the wider economy, and then on house prices and mortgages is close to impossible. It’s obvious that no market works in isolation, there are always knock on effects. The property market is very closely linked to the rate of employment and the behavior of the banks at the time. If businesses and organisations are growing and the economy is strong, banks will more likely lend, the property market will follow suit and be equally buoyant. When trying to analyse the property market you always have to look at the economy as a whole and the wider picture. In the name of a balanced argument and to help you make your decision here are a few common fears that people may have with Scotland becoming independent and a few potential positives of independence. Markets do not like uncertainty. Years of currency negotiations, pension uncertainty, EU membership and interest rate rises cannot be a positive for the property market. This could mean a long stagnation. Major influential financial institutions have declared that they will move south if a Yes vote occurred. This has huge employment and economic implications. Edinburgh’s financial sector alone employs 52,800 people. On an individual level, higher interest rates = more expensive mortgages = less investment in property sector. Full flexibility over our budgets will enable future Scottish Governments to take action to make more affordable housing. If we set our own property taxation rates to suit the market here, this could be positive. Scotland could have the power to cut corporation tax dramatically, incentivising companies to stay and others to come in. 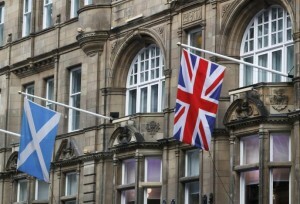 Independence supporters believe a Yes vote will mean an influx of diplomats, government staff and others to the capital. Embassies moving in and more civil servants being employed could make a positive impact on the housing market. So far, there haven’t been many noticeable changes to the market and it is true that things have been gradually improving since the credit crunch. People still need to buy, sell and rent property even though there is an independence referendum. We all need a place to live. First-time buyers will still want to get on to the property ladder, regardless of what the result of the independence referendum is going to be. People are still looking to rent in central fashionable areas, as they always have. Markets are driven much more by people’s individual economic and lifestyle factors than by macroeconomic and political matters. People react to political changes once they actually start to affect their lives, and tend not to make preemptive decisions. At this stage, it is all so hypothetical that little is likely to change. The months directly after Brexit and the potential Independence Referendum will see changes that we can make predictions on, but until that point the debates are purely academic.